Elizabeth Swanson Goldberg is Associate Professor of English at Babson College, where she teaches courses in international literatures and human rights. She is author of Beyond Terror: Gender, Narrative and Human Rights (2007) as well as articles in books and in journals such as Callaloo, South Atlantic Review, and Peace Review. Alexandra Schultheis Moore is Associate Professor of English at the University of North Carolina at Greensboro. She is the author of Regenerative Fictions: Postcolonialism, Psychoanalysis, and the Nation as Family (2004) as well as essays in edited collections and journals including Contemporary Literature, South Asian Review, Peace Review, and Genders. "This collection marks a timely and valuable contribution to the study of the intersections of human rights law, literature, and culture. 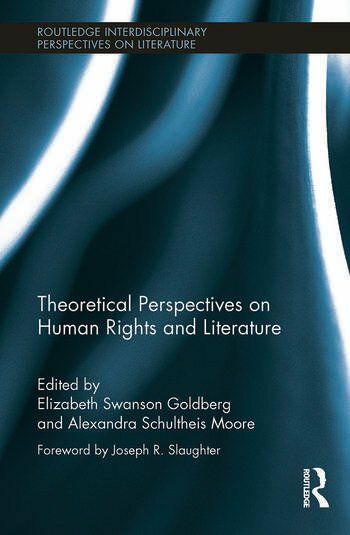 In etching out a human rights oriented literary and cultural criticism, contributors reveal the prominence of literary forms in normative reasoning and rights treaties, and provide a rich and productive analysis of the human rights paradox of universality and its complicity with global power, and the ethical challenges posed by representations that converge on atrocity and violence as narrative destinations." – Wendy S. Hesford, Author of "Spectacular Rhetorics: Human Rights Visions, Recognitions, Feminisms"